Among several compelling nominations, Ms. Pletch was described by her colleagues as “always focused on what’s best for our students and respects all staff” and “open, reflective, introspective and brilliant!” Ms. Pletch began her journey at Spaulding in January of 1989, making her one of the organization’s longest-tenured employees. 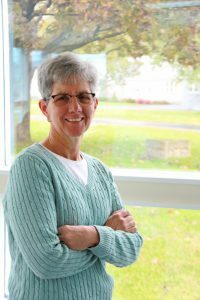 She started as the Associate Director of Clinical Services before accepting a position as Supervisor of the Lambert Program, where she managed the educational and residential program for 12 students. Following this role, Ms. Pletch accepted a training coordinator position which supported both academic and residential staff. When a Behavioral Analyst position was created in May 2014, Ms. Pletch was excited to return to her first passion and accepted the challenge of this new position. She continues to hold the same position today. Linda previously worked at the May Institute before earning a Master of Arts in Human Development and Family Life from the University of Kansas. She is a Board Certified Behavior Analyst (BCBA) and has also earned a certificate for Behavioral Intervention in Autism from UMass-Lowell. In her spare time, she enjoys golfing and visiting her daughter, son and grandchildren.